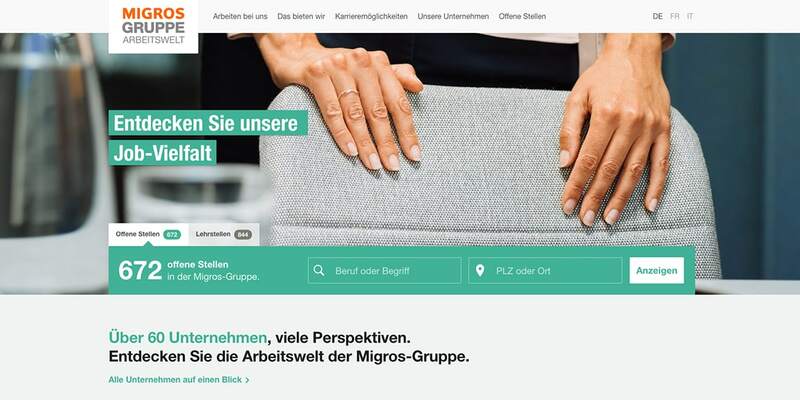 [Press release] Liip designs and implements the new Migros Group career portal. Since the beginning of this week, Switzerland's largest employer, with over 60 companies and business units, has been offering its own extensive online platform for job searches and job information. Starting today, the Migros Group has a central point of contact for career matters. The new career portal, Migros Group Arbeitswelt (www.migros-gruppe.jobs), presents all relevant information on the work environment of Switzerland's largest employer and its associated companies to users in a clear and structured manner. In addition to information on business activities, working conditions and numerous portraits of employees, the platform focuses on a comprehensive job exchange. The aim of the new offer is to make it easier for interested candidates to search for jobs and to find suitable job advertisements from the wide range of offers. Liip supports the Migros Group in its long-term strategy of positioning itself as an attractive and versatile employer. Liip has supported the Migros Group on the basis of a preliminary study, first wireframes and the CI/CD to design the new online career portal, to design it interactively and visually as well as to implement it technically. "One of the biggest challenges in the project was to map the complex group structure of Migros in a way that was easy for the user to understand," says Product Owner Martin Meier at Liip. The solution to this problem was, among other things, user testing of an early wireframe prototype and a consistent focus on the user on both the visitor and editorial side. Although the "Migros Gruppe Arbeitswelt" hosted more than 60 cooperatives and companies at the launch and the content was created by a correspondingly large number of teams, a very high degree of visual and structural consistency can be ensured through the site. This is made possible by a flat information architecture and numerous content modules that automatically adapt to the respective context. This gives cooperatives and companies sufficient flexibility and scope to optimize their new career site. The new online platform was implemented together with the Migros Group deliberately following an agile approach. The continuous optimization during the course of the project enabled us to develop a high quality product, which already comes with extensive functions in the first release. The focus is on the search function for 600 jobs per month and the 1500 additional apprenticeships advertised each year, which is extremely efficient and flexible due to the modern Vue.js frontend architecture. For content management, the open source system Drupal 8 was chosen. In summary, Micol Rezzonico, Head of the Competence Center Employer Branding, says: "Together with Liip, we have succeeded in building a clear and stable platform that can be developed further on a modular basis and gives the Migros Group the opportunity to make its extraordinary diversity and the many qualities in the field of career accessable". Responsible at the Migros Cooperative Association: Micol Rezzonico (Head of Competence Center Employer Branding), Christopher Schmidt (Project Manager), Pascal Schwager (Product Owner), Sabina Del Grosso (Content Strategy), Ivan Ganarin (Information Architect); Responsible at Liip: Martin Meier (Product Owner, Consultant), Jan Hug (UX Designer, Developer), Jonathan Minder (Developer), Krisztian Kovacs (Developer), Christian Wüthrich (Developer), Christian Stocker (Developer), Fabian Ryf (SEO/Analytics), Daniel Frey (Scrum Master), Tonio Zemp (Consultant).